In 1908, president C. H. Worcester announced that he would make Chassell his summer home and commissioned Paul Macneil to design a house. 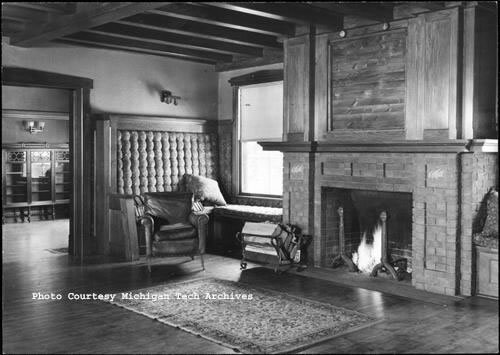 Macneil designed a two-story wood-frame house that measured 35’ x 60’, calling it a “typical old English country house.” The 20’ x 35’ living room was the featured space, with a large fireplace flanked by “two large high-backed old-fashioned seats, of the Mission-style, built into the wall.” All of the rooms had beamed ceilings and were decorated in the Mission style. Besides the large living room, the house had a smaller living room, two reception halls, a dining room, kitchen, and pantries, with three large bedrooms on the second floor. The house was wired for electricity and furnished with steam heat. The newspaper mentioned plans for a columned pergola measuring 40’ x 14’, although it is not certain if this was ever built.3 Photographs show a wide porch across the front and a porte cochere. 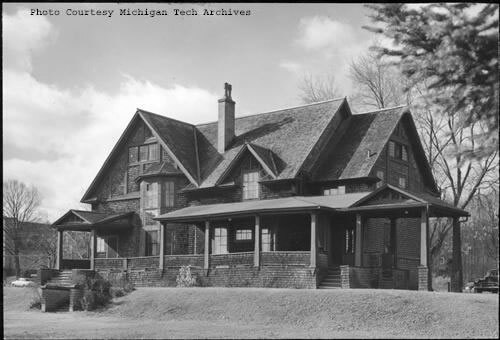 The Worcester Lumber Company went out of business in 1928, although Worcester and his wife, the former Mary Southwell, continued to return to his house in Chassell every summer until shortly before his death in 1956.4 In 1957 the Sigma Rho fraternity of Michigan Tech acquired the building and occupied it until a spectacular fire destroyed it in 1974. The fraternity built a new house on the site. Worcester House Interior. MTU Archives. Nicki Lassila, “History of Chassell,” Chassell, Michigan:100 Years of Pride (privately printed, 1988). “Chassell Man Is Head of Big New Lumber Company,” Calumet News, 3 August 1908. “An Old English Country House,” Calumet News, 4 September 1908. “Charles Worcester Dies Friday in Chicago Hospital,” Daily Mining Gazette, 24 March 1956.